These are translations to some songs by Pekka ja Susi (Peter and the Wolf), Anssi’s band in 1993-1999. 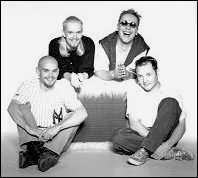 The band never got real success, their only hit was Karhun elämää, with which they won the Finnish Rock Championships in 1993. During its carreer Pekka ja Susi tried many different music styles, but mainly it was pop-rock. You might notice the song texts are much more symbolic than the text in Anssi’s solo carreer. Note that some texts are by other band members, although Anssi wrote most of their lyrics. Original text by Anssi Kela. Translated by Mari. And write a goddamn book! And direct the goddamn flick! And write the goddamn song! Original text by Anssi Kela. Translated by JMN. Original text by Petri Prauda. Translated by JMN. Will anyone be missing me? Original text by Ville Kela. Translated by JMN.